We are always being asked what our Memorial Diamonds look like before the raw diamond crystal is cut and polished, so I thought I should show you just one. Well - its almost like a dodecahedron or perhaps as an illustration - like 2 square pyramids with the bases glued togther but with more facets. 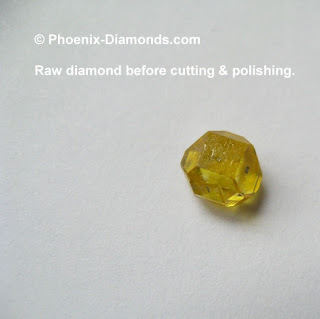 This is a NATURAL growth shape and colour of a memorial diamond crystal.